During the month of March, Pastor Eliezer Peter, seven staff members and two children will be joining St Stephen’s for some Professional Development and a brief holiday from Bethany Home. 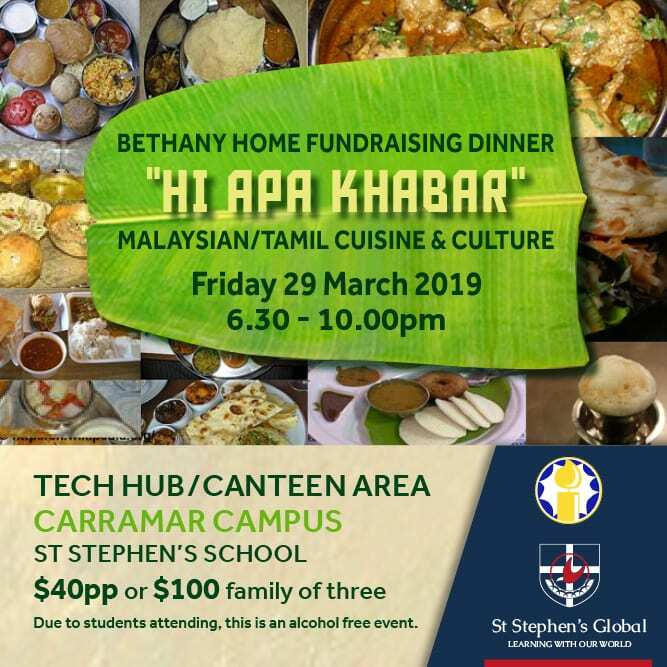 Whilst here, Pastor Eliezer and his staff would like to hold their annual fundraising dinner and, at the same time catch up with past and present ‘tour’ students and their parents. Dinner will be prepared by the Bethany staff and a variety of presentations will be delivered. Bookings and payment can be made using the Trybooking link below, at this time you will be able to purchase your tickets and advise of any dietary requirements you may have. On behalf of St Stephen’s School and Bethany Home, we look forward to seeing you there.